For quantitative fluorescent immunoenzymatic assay of NFkB phosphorylation status in cultured cells. Nuclear factor-kappa B (NFkB) is a transcription factor that plays a central role in many physiological processes, e.g. inflammation, tumorigenesis, and apoptosis. NFkB is activated by a wide variety of stimuli, including inflammatory cytokines such as TNF-α. NFkB is a dimer composed of members of the Rel family of proteins: p65/RelA, c-Rel, RelB, NFkB1/p50, and NFkB2/p52. 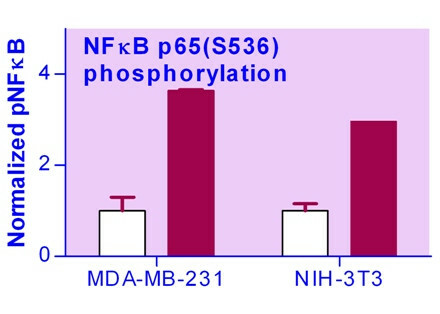 Phosphorylation of p65/RelA at Ser-536 results in decreased nuclear export and enhanced p65/RelA-dependent transcription. BioAssay Systems’ cell-based ELISA measures phosphorylated p65(S536) (pNFkB) in whole cells and normalizes the signal to the total protein content. This simple and efficient assay eliminates the need for cell lysate preparation and can be used to study NFkB regulation in short-term and long-term assays. Applications For quantitative fluorescent immunoenzymatic assay of NFkB phosphorylation status in cultured cells.